Despite being worn-out from writing all night, Takahashi agrees to meet his friend, if only to try to stop him from going off on a wild goose chase. Once Sonamura decides he wants to track down the main culprit, a beautiful woman with a cruel face, the game is most definitely afoot! Of course, the work is far more subtle than this would all suggest. Tanizaki is playing a different game, both with his alter-ego Takahashi and the reader, and Vincent’s excellent afterword lets us in on some of the secrets. The text mentions Edgar Allan Poe’s story ‘The Gold Bug’, which provides the inspiration for the note in code that Sonamura finds, telling him of the time and location of the crime. Vincent explains that this story was well-known at the time in Japan, and that Tanizaki has actually adopted certain aspects of the piece, transporting the action from California to Tokyo. In fact, the translator even took the liberty of echoing some of the language from that story in his work, adding an extra layer of complexity to the English version. 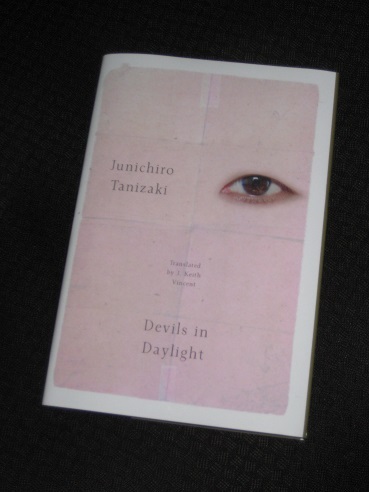 Despite Vincent’s excellent work, though, the success of Devils in Daylight is due mainly to Tanizaki’s masterful handling of his material. As is the case elsewhere (for example, in several of the stories in the collection The Gourmet Club), the story is built around a jaded Japanese bourgeois looking for new thrills. Having tried a variety of activities to fill his free time, Sonamura is desperate for new kicks, and this mystery is just what he needs to amuse himself. Much of the humour of the book comes from Takahashi in his role as the nervous sidekick, an unwilling accomplice who would much rather be tucked up in bed at home than roaming the dark streets. However, the true star of the story is the woman the two hapless amateur detectives see in the old house. Both agree that she has an uncommon beauty, but they’re slightly puzzled as to the kind of woman she is, unable to decide whether she’s a geisha or not (both men are intimately familiar with the Tokyo demi-monde…). What is clear is that she’s a deadly beauty with the ability to entrance men and then make them disappear without a trace. Another of Vincent’s remarks stresses Tanizaki’s love for the movies, and there’s certainly a cinematic feel to the pivotal scenes, with the two men watching on the other side of the wall. The unknown woman is framed by the knot-holes, as if on a screen, a femme fatale if ever there was one. To Takahashi’s horror, his friend decides that he’ll get no rest until he tracks her down, but the writer an’t help but think that poor Sonamura may well end up as the next victim. Very excited by your Tanizaki season: judging by Quicksand and The Gourmet Club, he’s a far cry from the Japanese cliché of understated decorum. Where would you recommend to start? Tanizaki is one of my fave Japanese writers… Some prefer nettles, Naomi, The Makioka Sisters, Diary of a Mad old man, enjoyed all of these. I have Devils in Daylight on my bookshelf, haven’t gotten around to it yet as my backlog is ridiculous. Jeff – Sometimes you just have to make the time for yourself (I wouldn’t have imagined that I’d go through ten of his books in such a short time-span, but once you start…)!